»Why is Pulicat Lake India's Second Largest Lagoon? Why is Pulicat Lake India's Second Largest Lagoon? Nestled on the border of Andhra Pradesh and Tamil Nadu, Pulicat Lake is India's second largest lagoon. Although 90% of the lake falls in Andhra Pradesh, the other 10% comes under Protected Areas of Tamil Nadu. This beautiful lake comes under the category of 'brackish water' lakes, that which is saltier than freshwater but not as much as seawater. Previously known as "Pralaya Kaveri", Pulicat Lake is home to a wide range of aquatic creatures and birds. Therefore, the lake has been turned into a bird sanctuary. Recently, the lake has been suffering some threats due to sewage infusion brought by the Buckingham canal, pollution from industrial effluents and chemicals. However, many measures are being taken by the government to protect this natural beauty. Pulicat Lake is fed by River Kalangi and River Arani. The lagoon is separated from the Bay of Bengal by a barrier island which is the Sriharikota. The lake has many nutrients due to which microscopic plants grow in plenty. Fishes feed on these plants, and these fishes attract all the birds that migrate to the lake. The months between October to March are perfect to visit the glittering Pulicat lake. During this time, the weather is very pleasant and cool, and also the migration of all the unique and different species of birds occurs. Summer in the region can be very hot, therefore, it is advised to avoid the visits in months of March to May. However, if you do visit the place during summer, make sure to equip yourself with sunscreens, sunglasses and hats/caps. 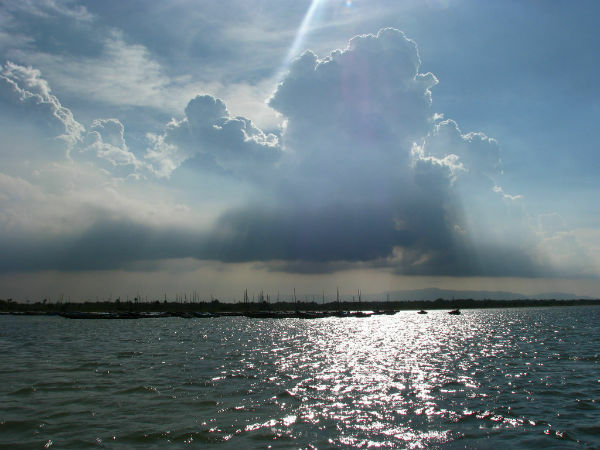 The Pulicat Lake has a rich history with people of many countries harbouring the place. In the 13th century, Arabs who were banished from Mecca were said to have migrated here. Some houses belonging to these Arabians are still found in the region. Similarly, in the 16th century, the Portuguese colonized the lake which was later taken over by the Dutch. Fort Geldria, a relic of the Dutch which is now under the protection of Archaeological Survey of India (ASI), can also be visited in its vicinity. Mainly during the autumn and spring seasons, Pulicat Lake serves as the third most important spot for migratory birds. Grey Pelicans and Open-billed Storks are the two inhabitant species of bird found at the lake. Flamingos form the highest number of migratory birds with almost 15,000 of them flocking the Andhra Pradesh part of the lake!! The other species of birds that migrate to this lake include Marsh Sandpipers, Reef Herons, Spotted Pelicans and Black-tailed Godwits. The lake is home to around 160 species of fishes, and a large number of prawns, mollusks and other aquatic species. The bird sanctuary is open from morning 6 am to evening 6 pm. A "Flamingo Festival" is held every year during the month of December at Pulicat Lake. This 3-day festival has musical programmes, food stalls and is filled with jamboree during this time. Boating is allowed as a part of eco-tourism in the Pulicat Lake. Sailing or boating on flat-bottom boats are allowed, and not on motorized boats. These boats are also available exclusively for an entire day for the price of Rs 400. The Fort Geldria, also known as Dutch Fort, is a must visit. Built on the shores of Pulicat Lake in 1613, the fort used to be Dutch Republic's seat when they colonized the region. This beautiful fort was later attacked by Etheraja, a local chieftain of the time, and then the Portuguese. However, it was restored by the British in 1714, and finally now it is under the protection of ASI. Satish Dhawan Space Center located on the barrier island of Sriharikota, is another place of interest near the lake. It has recently been opened to the public with replicas of rockets more, present for an exhibition. By Air: The Chennai International Airport, located almost 100 km from Pulicat Lake is the closest airport. It connects to all the major cities such as Delhi, Mumbai, Kolkata etc. From here, buses can be taken or cabs can be hired. By Train: Sullurupeta Railway Station is located oddly 20 km from Pulicat. This station connects to cities like Hyderabad, Chennai and Visakhapatnam. By Road: NH 5 located in Chennai leads to Pulicat in Nellore, Andhra Pradesh. A number of buses travel from Chennai to Pulicat and is a journey of about 2.5 h to 3 h. Cabs or personal vehicles can also be driven through this route.